With continually rising housing prices, residents of the Golden State are waking up from their California dreamin' and looking to move somewhere more affordable. 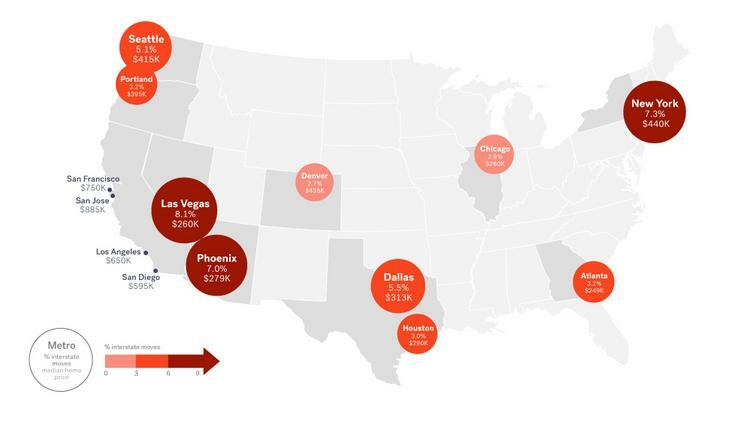 One of the top markets Californians are fleeing to is Denver, according to a recent report from real estate website Trulia, which analyzed users from San Francisco, San Jose, Los Angeles and San Diego where homes on the market averaged $720,000 in March 2017. That compared to a nationwide average of $250,000. Denver was the No. 10 top market for outgoing Californians, attracting 2.7 percent, according to Trulia. New York City was No. 1 at 7.3 percent, followed by Las Vegas at 8.1 percent and Phoenix at 7 percent. The median listing price for a home in Denver in March 2017 was $437,500, according to Trulia. Denver has been particularly attractive to Bay Area tech companies in recent years. Other Californian magnet markets include Atlanta and Chicago as well as other West Coast tech hubs Seattle and Portland. Click here for a closer look at the Trulia report. Read the full article by Tim Gallen here.